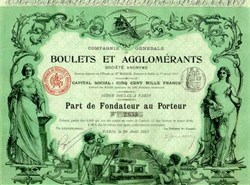 Beautifully engraved Certificate from the famous Compagnie Generale Boulets Et Agglomerants issued in April 1912. This historic document has an ornate border around it with vignettes of machinery, allegorical women ( one partially clothed), and two babies. This item is hand signed and is over 96 years old.